Sometimes historic occasions, like seeing black people in South Africa queueing for days to vote for the first time, or seeing the Berlin Wall coming down, are when in the words of the poet Seamus Heaney, hope and history rhyme – and the world looks on in a kind of disbelief. These are always occasions that people thought would never happen – and then somehow they do. It felt like an historic time to be in the Dominican Republic in September, something significant was happening, though it has not been widely commented on in public. A migrant labour force from Haiti, who for decades had no protection by law in the Dominican Republic, were receiving the paperwork that would begin to secure their rights. The Dominican Republic shares a land border with Haiti, one of the poorest countries in the world, and hundreds of thousands of poor Haitians have crossed the border to work there. The Dominican Republic and Haiti exist side by side on the island the Spanish had previously named La Espanola, now known as Hispaniola. Don Christoph Colon, Christopher Columbus to us, first bumped into the Americas in the Dominican Republic. The story of those times is everywhere, still alive in the walled colonial city of Santo Domingo; in the palace his son built there in 1511, and which still has much of the original furniture in it. It’s alive in the fort they built that guards the river they sailed in on and alive in the vaulted cathedrals they built – it seems as quickly as they built their forts – for body and soul both needed protection in this brave New World. 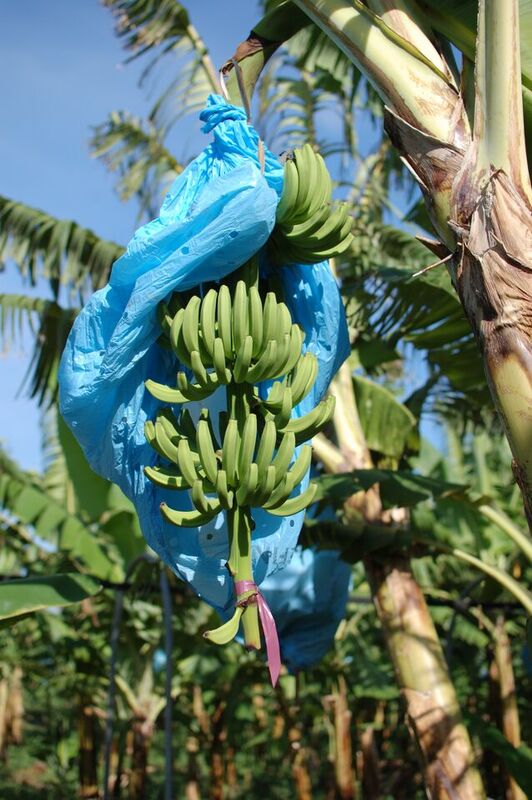 We visited the Dominican Republic as part of a delegation from European Fairtrade organisations, namely the UK, Sweden and Ireland, who buy much or all of their Fairtrade bananas from the country. None of us had been there before. All of us were aware that there were serious issues there in relation to illegal migrant labour and workers’ rights. Jean Francois (in red) and Ditapieu have both been working illegally for over twenty years. You could see in their presence how proud they felt to be stepping out of a shadow-world and into their own lives. Real people with a name and soon to have their papers! They were both waiting in line to receive their carnet (identity card) which will legally recognise their presence in the Dominican Republic and is valid for 1 year in which time they need to get a Haitian passport. Haitian migrant workers think that the carnet is great. They usually go back to visit their families about 5 times a year and, before this change, the return journey would cost them between 3000-3500 pesos (USD $60-$80). Now with the carnet it will only cost them 500 pesos ($10) because they won’t have to pay to cross the border. For them it is a considerable saving as the average wage for a banana worker in the DR is about $6 per day. At a time when Europe has seen as many people seeking refuge from war as during the 2nd world war, it was challenging in the best sense of the word to be talking about the problem in a country long criticised for its treatment of migrant workers. Maybe there are things that we could learn from the Dominicans. The same problems effecting illegal Haitians in the Dominican Republic are estimated to affect more than 20,000 illegal migrants in Ireland and 50,000 illegal Irish migrants in the US. Migration issues literally know no borders and affect countries everywhere. Anecdotally estimates of the total number of Haitian migrants vary hugely. The border is completely porous except for a few checkpoints on roads, so estimating the number of migrants is difficult if not impossible. What can be said with more accuracy is that nearly 300,000 people have applied for the regularisation of their situation since the process began in June 2014. Apparently about 90% of these applications have now been formally accepted and the paperwork for issuing passports or identity cards is in train. Vice Minister for Labour, Winston Santos, informed us that 67% of the total banana workforce are non-Dominican i.e. Haitians. And that about 74% of these Haitian banana workers had applied for regularisation during this process. In the plantation sector about 97% of Haitian workers have been registered. The Dominican Republic is the second largest producing country for Fairtrade bananas after Colombia and nearly 50% of what they produce is sold on Fairtrade terms. Banana farms vary in size from about 3 hectares to hundreds of hectares. By far the most important market for Fairtrade bananas is the UK, where nearly 50% of all the Fairtrade bananas in the world are sold. Virtually all of the Fairtrade bananas sold in both Sweden and Ireland are from the Dominican Republic. It is estimated that nearly US$10,000,000 extra in Fairtrade premium was earned through Fairtrade sales in 2014 in the Dominican Republic. Banelino is a smallholder banana cooperative based in the North-West banana producing region of the Dominican Republic. The organisation was originally founded by 30 members who acquired their farms through the agrarian land-reform. Under the dictator Trujillo who ruled from the 1930s, arable land was seized and peasants were evicted. However, after Trujillo was overthrown in 1961, an agrarian reform took place where land was redistributed to the ‘campesinos’. Banelino’s membership has now grown to almost 300 members, one-quarter of whom are women. On average, the members manage farms that are sized under 5 hectares, which is about the same size as 7 football pitches, and slightly smaller than the average-sized farm in the country. About 90% of what they produce is sold as Fairtrade. Banelino spends a significant proportion of its Fairtrade premium income per year on health programmes. They have a clinic on the same site as their offices in Mao which is accredited as an official health service provider and offers professional care to over 3,000 patients a year. The clinic includes a small pharmacy where the medicine is sold to people at cost. They also have equipment to carry out blood analyses to test for deficiencies and HIV. In the Montecristi region Banelino does not have a clinic because poverty levels are so high that people would not attend a clinic. It is therefore necessary to go out into the community directly (setting up a mobile clinic in community building such as schools or churches). This programme has been running for 19 years. On average 10,000 farmers, workers and their families are treated each year through their clinics and mobile health-unit services. In addition, Banelino has 2 ambulances, as in the rural areas there is no medical transport for emergency care. Banelino’s health team includes 2 doctors (one based in their clinic and Mao and one who works directly in the field in rural communities), a nurse and a team of 15 health promoters. The promoters are volunteers who receive training on health and nutrition and are able to raise an alert if they recognise that one of the members of their community is in need of medical care. As well as this health care services Banelino also spends a significant amount of its Fairtrade premium, about 30%, on educational programmes including a special needs school that has 86 children and 33 teachers. Banelino is a hugely successful cooperative, which produces a significant volume of Fairtrade organic bananas for some of the biggest UK supermarkets mostly on small farms of only three hectares. What struck me most was that if Banelino did not exist, neither would a number of schools or teachers in the two regions of Mao and Montecristi. The 10,000 people who benefit every year from Banelino’s health programme do not have any alternative. Banelino’s commitment to empowering not only themselves but others in their community is both inspiring and humbling. 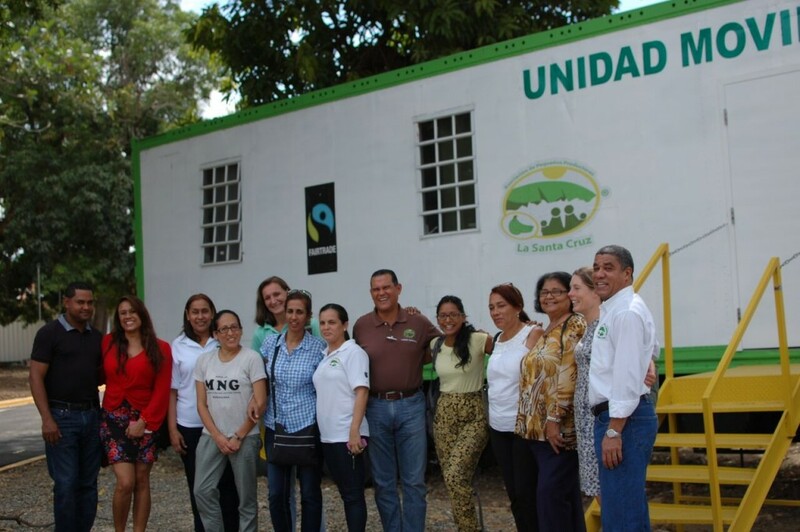 La Santa Cruz is another small-farmers organisation in the Dominican Republic which is selling a significant percentage of what they produce on Fairtrade terms. They have built a new cooperative centre for members and also have a new health clinic operating from the centre. We visited a number of much larger farms where hundreds of workers are employed and where the Fairtrade system works differently than with small farmers. On bigger farms where large numbers of people are employed, Fairtrade tries to ensure that workers are well represented and decide for themselves how the extra money earned through Fairtrade sales should be spent. Fairtrade sees respectful systems of industrial relations, where workers’ representatives and management negotiate terms and conditions of employment as the way forward. Fairtrade believes that independent trade unions, free from control by management, are the best way for workers to organise themselves. Independent trade unions are also the only groups in law who can negotiate collective agreements with employers. At the moment the trade union, FEDELAC, is only beginning to organise workers on banana plantations. Workers on Fairtrade farms have come together to represent themselves in different premium and worker committees. These groups of workers often do a good job of representing themselves and making decisions about the use of the premium money earned, but they can’t serve the same purpose as an independent trade union in the banana sector. The Fairtrade system requires that at least 80% of the extra money earned through Fairtrade on plantations needs to be spent on community based or collective projects on behalf of the workers. As with the small farmers, the workers groups often choose to spend this money on health and dental care. In recent years in response to the drought being experienced, some workers are deciding to provide for water tanks to store water for when the taps runs dry. Some of the premium committees have invested some of the extra money in houses for the workers. But 20% of the Fairtrade premium can be used as an extra bonus payment. On a couple of the plantations we visited, this amounted to more than an extra month’s salary. Interestingly, in countries like the Dominican Republic where there is a high level of migrant labour, it would be possible according to Fairtrade Standards for workers to use up to 50% of the Fairtrade premium for personal benefits. This is a fairly recent Fairtrade Standard provision which hasn’t happened anywhere yet. One of the most important discussions we had in the Dominican Republic was with representatives of larger plantations (some of whom employ hundreds of people), along with representatives of trade unions, the local Fairtrade producer organisation, other NGOs. The meeting was the first of its type and, though difficult sometimes, it was also an example of how Fairtrade can bring people together in common cause for both shared and individual benefits. We came across things that will stay with us for a long time – and not just the heat. They say there are two kinds of heat in Dominican Republic – hot and hot as hell! We got the latter. Things like the Banelino cooperative’s examples of how to spend the extra US$1 million a year in their communities – mostly on well targeted education and health care; the plantations we visited where the importance of the 20% use of premium as a bonus payment was clear, and seeing the groups of Haitian and Dominican workers sitting together trying to figure out together the best way to spend the rest of the extra Fairtrade premium money; the willingness of the trade unions and employers to sit together for the common benefit of their banana industry; the ability of the local Fairtrade organisation, the CLAC, to bring everyone together for round table discussions; the humour, and slagging from some the business people running the banana plantations; the small banana packing stations out in the middle of nowhere where small farmers box off their bananas once a week. The list of stand-out items is as long as a banana leaf! Mostly I’ll remember the long lines of Haitians collecting their registration papers, the generosity of all the Dominicans who hosted us; engaged, discussed, and disagreed with us. Workers who spoke openly about the problems they face and their various hopes for a better opportunity for everyone in the Dominican banana industry. Of course there are things that need to be sorted out – like the completion of the regularisation process. But I came away from the Dominican Republic thinking that many people there are very serious about sorting problems together. We can help them by buying their Fairtrade bananas, by continuing to support dialogue and inclusion in the banana sector there, and by recognising the progress they are making. Chair of Fairtrade International’s Workers’ Rights Advisory Committee.